What should be included in “Balanced Report Cards” about schools? Is understanding the whole child important for teaching and learning ? How do we appropriately interpret a child’s academic data, produced while at a school desk ? Can we ever understand academic results in a vacuum ? 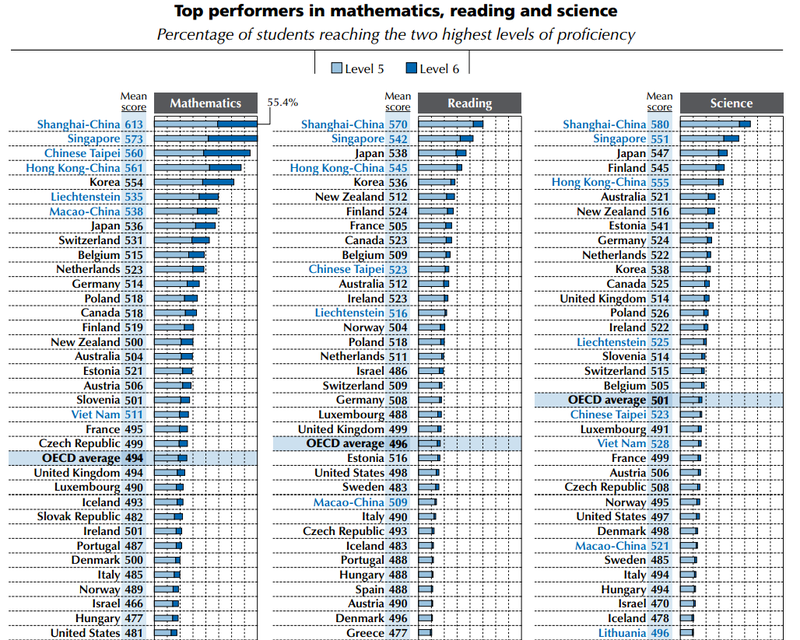 “The OECD, the organization that brought us PISA scores, which for critics of public schools act as the bellwether for school success, recognizes that the well being of children encompasses more than test scores and, therefore, publishes rankings on material well-being, housing and environment, health and safety, risk behavior, educational well-being, and quality of school life. My own perspective, from the front line, in the classroom, with trauma-impacted children, is that Professor Duncan Owens is right on target: We ignore, or we assume away other factors about the whole child, at our own loss of understanding, the child’s loss of ‘differentiated’ education, and most importantly, loss of equal access to education (for all children). See “Common Sense: Defending Childhood“. Our ignorance or our silence is inexcusable, specifically in the face of the epidemic of childhood trauma. See “Peek Inside a Classroom” (Jasmine) and (Danny Goes to School). Our own Department of Justice report (Defending Childhood) describes childhood trauma as a national “crisis”. Yet, I have never seen a “Balanced Report Card” published with community rates of childhood trauma. What’s more important ? What’s more insightful? Testing results at a school desk (in a vacuum), or a ‘balanced’ report of the whole child’s life experience. How do you compare scores without understanding the whole experience ? How do you begin to remediate (or get it right from the beginning), if you only look at results at the school desk ? Meanwhile, the most recent PISA 2012 academic (only) results are below, for those “systemic educational reformers” who focus solely on the academic silo. Something in our increasingly, academics-only, USA paradigm is obviously not working well …. In my last post I suggested that if the government is so intent on publishing standardized testing data as an indicator of the effectiveness of teachers and schools, they should likewise publish other meaningful data on the communities teachers and schools serve. In What’s Missing in Education “Reform” ? Daun Kauffman discusses another dimension of child wellbeing that is distinctly missing from discussions of education reform. One dimension that is missing, according to Kauffman, is “the massive incidence of childhood trauma, and its laser-like connection to cognition and education ….” Children who live in urban settings typically experience more incidents of trauma. “What are the aggregated, community rates of Childhood Trauma, or “Adverse Childhood Experience” (ACE), as separate from ‘poverty’?” What are the reported incidents within a community of physical abuse, sexual abuse, emotional abuse, and physical or emotional neglect? How many children are being raised in single parent homes due to abandonment, separation, divorce, or incarceration? What are the reported incidents of household violence, substance abuse, and mental illness? It is not without irony that education reformers posit that improvement in the academic lives of children begins and ends at the schoolhouse door and they distance themselves from meaningful data about the realities of the lives of too many children through “no excuse” rhetoric that teachers can demonstrate academic improvement for every student regardless of all the factors that impact their lives. No other profession is held to the same level of accountability, responsible for one narrow set of outcomes in spite of all other dimensions of human life. Again, if the federal government is so intent on public disclosure of standardized test scores as an indicator of the effectiveness of teachers and schools, they should be required to provide a full picture of the data that impacts the lives of children. Then, perhaps, teachers will get the credit for their noble efforts in trying to educate children who face almost insurmountable challenges every day. As one teacher I interviewed a few years ago poignantly stated about her young students in a high poverty community, “I’m trying to teach these children to read and they’re trying to survive.” I’ve experienced firsthand the devastating impact of unsafe communities on the lives of children. I’ve heard children speak of family members murdered, imprisoned, and lives lost to drugs and crime. I saw little children take freshly sharpened pencils and pretend to inject themselves in the tiny little crooks of their arms. It broke my heart. How dare education policy makers ignore the realities of the lives of far too many children in the U.S. when they boldly and callously propose systems for holding teachers accountable for academic performance while ignoring the devastation of too many of the communities that create the world children have to navigate through on the way to and from school? Children deserve better. Thank you Professor Duncan Owens. Incredibly important source of information on what is really happening to the children whose voices are ignored. I am throttled by your reporting and compelling descriptions. Thank you Daun!